Irish Gifts - Lucky Pewter Shamrock, Horseshoe and Penny Key Ring and Lottery Ticket Scratcher. 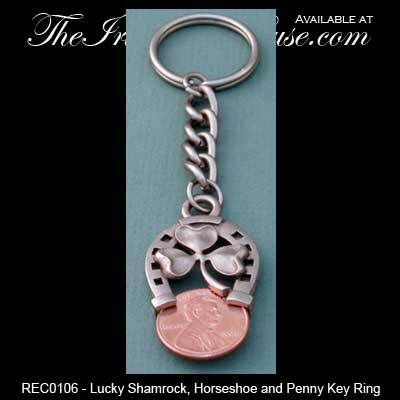 Irish Gifts - Lucky Shamrock, Horseshoe and Penny Key Ring and Lottery Ticket Scratcher. Metal and Pewtter Construction, Measures 4 1/2" Long, Gift Boxed. Made in the USA.